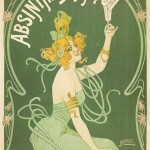 The drinking of absinthe is often very ritualized activity, involving specialty spoons, glasses, sugar cubes, and other beautifully decorated paraphernalia. You don’t have to be a vintage-lover to appreciate the delicacy and care that went into crafting these Green Fairy accoutrements. 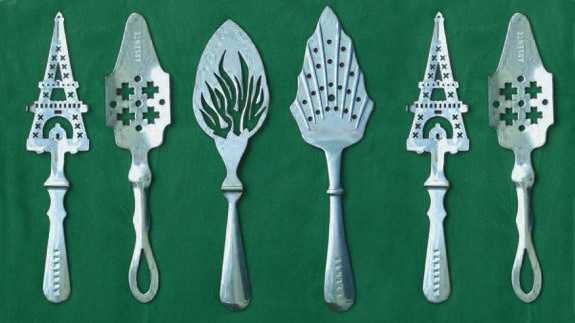 Absinthe spoons (pictured above) were traditionally highly ornate and unique, and were used to hold sugar cubes as ice water was poured over them, a process called La Louche. 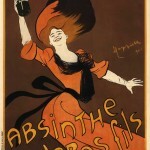 Many traditional absinthe spoons are extremely intricate, some even incorporating gem stones. 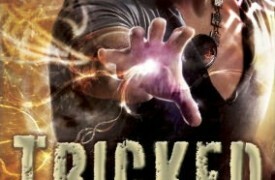 These beautiful spoons have been appropriated by artists and crafters for use as jewelry. 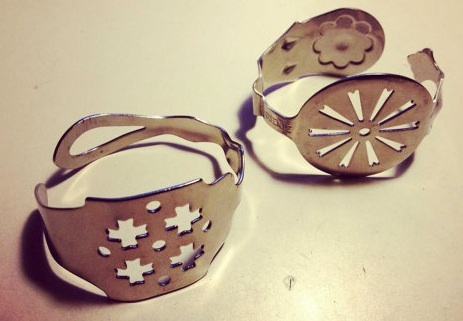 This simple bangle design (pictured right) by The Tamerlane makes a bold and unique accessory. 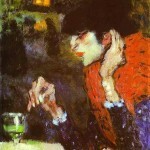 Sugar cubes were traditionally melted into glasses of absinthe through an absinthe spoon, and were often art object in themselves, beautifully wrapped in colorful packages for individual use. 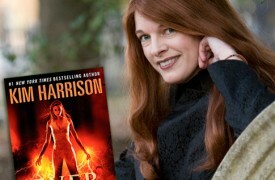 Today, there are many varieties of sugar “cubes” sculpted into different shapes. 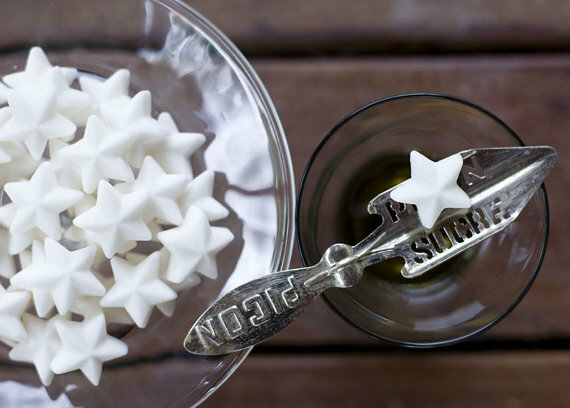 We love these star-shaped “absinthe-minded” sugar cubes (below) from Austin Sugar Works. 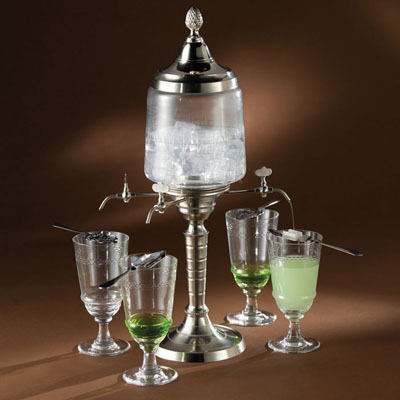 Absinthe Fountains are elegant and ornate water dispensing vessels with multiple spouts, used to stream ice water into the concentrated absinthe liquid. Though a simple carafe was a more traditional vessel for this process, it was thought that fountains gave a more steady stream, resulting in a more ideal La Louche. 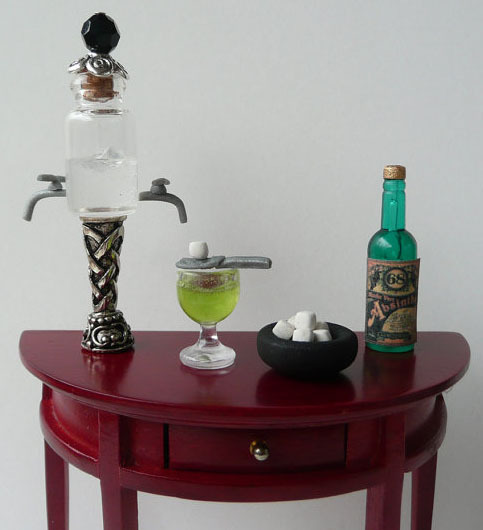 Vintage absinthe fountains are very much an iconic accoutrement for the Green Fairy. 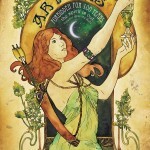 This majestic French Absinthe Fountain was featured on The Green Head. 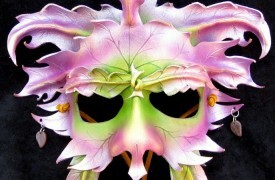 Finally, what could be more appropriate than a whimsical fairy-sized set of all the classic Green Fairy accoutrements? This finely-detailed miniature accoutrement set, made by the husband-and-wife team behind Kaleidoskopic Romance, was intended for use in a dollhouse, and includes everything a Green Fairy needs, right down to the sugar cubes. 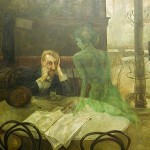 Read more about the Green Fairy.